The classy stone is Portoro Marble from Italy. Carving this stone is a love-hate relationship–the colors and patterns are completely seductive, the stone itself is a challenge to carve. As you might guess, each color is a different hardness. In addition to that, the black is very brittle and crumbly due to the high carbon content in the black parts of the stone. It also smells like swamp gas when cut or ground–how appropriate! This was my first experience carving Portoro and I naturally reached for a diamond blade to block in the basic forms. The intense vibrations from cutting caused the stone to crumble, prompting me to abandon this approach and seek advice from my stone-carving colleagues. 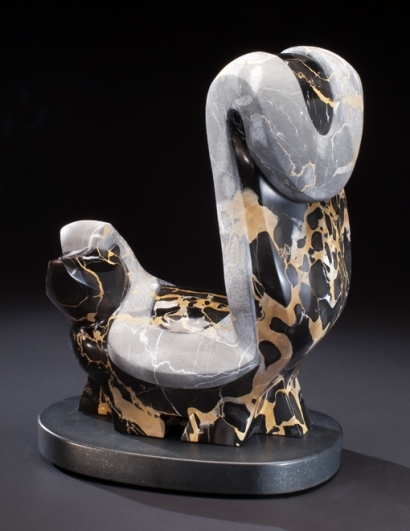 My friend and very accomplished stone sculptor, Vanessa Clark, advised me never to cut this marble–rather, it must be shaved (caressed) gently with a granite blade, or ground with a diamond wheel or burr. This technique makes for very slow carving, but it works wonderfully well and the effort was definitely worth it. The more I carved the stone, the more I loved working it and looking at it. Finishing the stone was another adventure. The stripe on this Striped Skunk is raw stone finished to 60 grit and then textured. The “fur” is sanded to 2000 grit and polished with a mixture of tin oxide and oxalic acid–a poisonous mixture that can be absorbed through unprotected skin and cause liver damage. Ooh. Chemical gloves eased that excitement, but it was still a pretty intense experience. The oxalic acid melts the stone and the tin oxide is a very fine abrasive that polishes it. Before the toxic mixture was applied to the stone it was very dark charcoal gray with colored figure. The polishing made it pop to a high shine and all the colors became more intense. Making The Uptown Skunk was something like falling in love over and over and over again. Each step revealed more of the beauty of this stone.